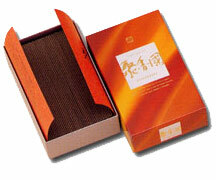 Syukohkoku "Silk Road" contains a very high grade and content of fine Aloeswood. Recommended to provide motivation and devotion to meditation. Suggested for experienced practitioners, and for special times. People gather in aromatic union, the spirit of Koh (incense) unites all. "Syu" (shu) means Gather, "Koh" means Incense, "Koku" means Country. Syukohkoku literally means "Gathering of Incense Nations". This of course is a reference to the Silk Road which was forged to trade silk from China to the West.